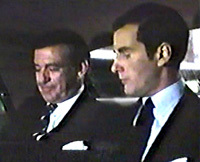 Rod Taylor played Edward Adeane, the longtime private secretary to Britain's royal family, in this TV movie tracing the courtship of Prince Charles and Lady Diana Spencer. Caroline Bliss made a decent Diana, but David Robb was unconvincing as Charles in this ABC-TV movie that aired Sept. 17, 1982. Despite star billing, Taylor has just three brief scenes, the best of which is an interaction with Lady Di in which he shares some wisdom as her wedding day nears. The film culminates with the royal wedding in July 1981, giving the tale a happy ending. In a case of dueling TV royal romances, ABC's version beat CBS to the airwaves. "The Royal Romance of Charles and Diana," which featured Catherine Oxenberg as Diana, aired Sept. 20, 1982 -- just three days after the ABC edition. 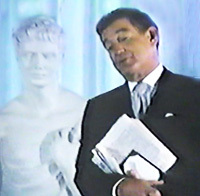 Author Stephen Vagg interviewed the show's producer, Clyde Phillips, in "Rod Taylor: An Aussie in Hollywood" and Phillips had much praise for Rod. "He was the consummate professional," Phillips said. "He was prepared, he was a leader on the set. ... He's not in the movie a lot, but what he is in, he's memorable." In his review in the Sept. 20, 1982 edition of the Washington Post, Tom Shales compared the two TV movies, calling ABC's offering "about 48 times better than the CBS movie." The big difference, Shales noted was that "ABC's movie really was about something -- partly, about how the mercilessness of the public eye can jar someone unaccustomed to it -- while the CBS film lazily goes the gaga route: slack-jawed heraldic voyeurism incapable of, and apparently uninterested in, transforming remote news figures into believable mortals." 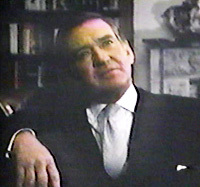 Regarding the role of Edward Adean, Shales wrote: "On CBS we find Ray Milland, looking, in a black suit, like a collaboration by Charles Addams and Edward Gorey and sneering as though he smelled cabbage cooking in the next room. ... The same part in the ABC movie was played by Rod Taylor, but he made a lot more of it."